Remember these? 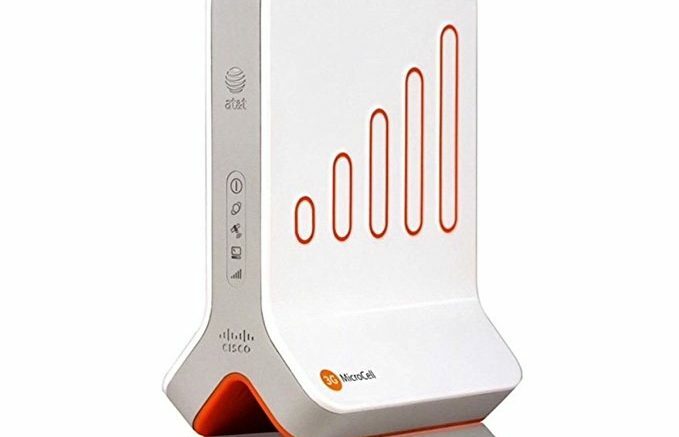 This was the AT&T Microcell and it was designed for people who had internet service but no cell service indoors. It seems like a cool idea, but it’s gone now. Back in the day, AT&T gave these out for free or at reduced prices, but they’re no longer doing that. Unless you find one on eBay or in a dusty corner of your local AT&T store. you won’t be able to get one at all. A microcell is pretty much exactly what you think it is. It’s like a little cell tower that connects to your internet service. It can provide voice and 3G data service where there isn’t any service otherwise. It was a great option in its day, mostly because there were no other options if you had no cell service. The advantage of a microcell is that it will work when there is absolutely no cell service at all as long as there’s an internet connection. In the early days there were voice-only microcells that even worked just by connecting to a land line. Why did AT&T discontinue the microcell? Instead of the microcell, AT&T now recommends you use the Wi-Fi Calling feature found on most phones. Wi-Fi Calling of one sort or another has been around for years now and even if your phone doesn’t directly support it you can still use Google Voice, Skype, FaceTime Audio, or some other protocol. Wi-Fi Calling isn’t as convenient as a microcell because people actually need to be connected to your home’s Wi-Fi network. You could set up an open guest network for people instead of giving them access to your home’s main network if you want. Either way you’ll still need to tell people how to get connected. On the other hand, Wi-Fi calling works with phones of all carriers. The microcell only works with AT&T. Also, the microcell never gave more than 3G internet. That means you were most likely going to give people your Wi-Fi password anyway… 3G is just so 2007. AT&T did heavily discount the microcell as I said and so it was never a moneymaker for them anyway. There’s a better option than a microcell or Wi-Fi Calling if you have even as little as one bar on your phone. If you can stand on your roof and make a phone call then you can use a cellular signal booster. A cell booster takes the signal from outside, gathers it with a much bigger antenna than the one on your phone, and rebroadcasts it inside the house. It works with all carriers and in almost all carriers you get data as well as voice. A cell booster is the hands down best choice. You don’t have to give anyone the Wi-Fi password… their phones just work. They’re a little pricey, but less than you’d pay for a high-end phone. One booster covers everyone in your home and will generally last 4-5 times longer than your average cell phone. When you think about it that way, it’s a great value. If you’re looking for a cell booster, check out the great selection at Solid Signal. You can browse through the hundreds of choices from great companies like weBoost, Wilson, SureCall and others. If the choice gets to be too much, check out the graphics at the top of the page and get a personalized recommendation from one of our professionals. You’ll be glad you did. Every cell booster from Solid Signal comes with phone and email support. They’re easy to install, too! If you can climb on your roof and turn a wrench, you have all the skills you need! Will a cell booster help you underwater?